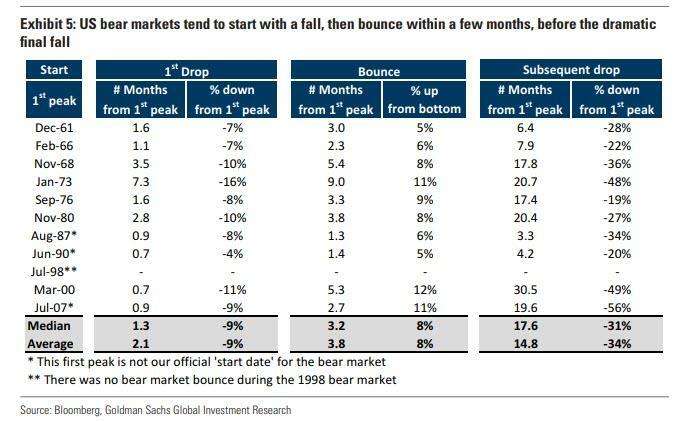 Two months ago we reported that according to Goldman's bear market indicator, the risk of a market crash dead ahead was higher than before the dot com bubble burst in 2000 and ahead of the 2008 global financial crisis, or as Goldman puts it, "our Bull/Bear market indicator is flashing red." Fast forward two months, and one market correction later, and Goldman's mood has only gotten worse, not helped by the brutal market action of October, which saw many assets hitting a bear market, and the S&P falling on 16 of the 23 trading days while, collectively, equity markets across the world shed around $5tn of market cap. First, the growth/inflation mix is turning against equity returns. Second, a sharp decline is often followed by a bounce. The problem here, stated simply, is that the global economy which had seen a significant boost from record loose financial conditions in 2017 and was further buoyed (particularly in the US) by the fiscal boost, is starting to lose momentum. Goldman economists’ 4Q estimate for growth has already slowed to 2.6%, well below the prior two quarters. Worse, looking ahead, as a result of the tightening of financial conditions and the prospects of diminishing support from fiscal policy is likely to result in the US economy slowing to a year-on-year rate of 1.75% by 4Q 2019. As Exhibit 1 shows, the interest rate rises in the US economy over the past couple of years have been offset by very strong growth. As we move forward in time, the balance between growth and inflation deteriorates. Around the top of a bull market, we often see slightly higher volatility and a peak followed by a correction, and then another peak. We have seen corrections twice this year: in January and then again in October. 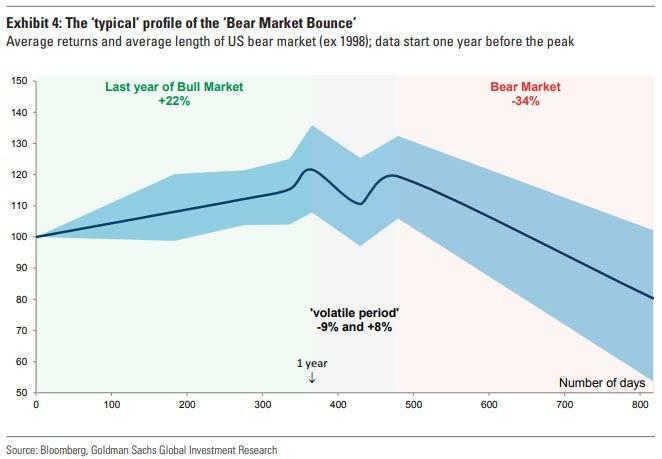 Bear markets do not tend to occur in straight lines. There is nearly always a bounce after the initial decline, providing investors with another opportunity to reduce risks if there are sufficient signals at the time to suggest a further decline is likely. The profile of the average bear market (starting in the post-war period and using US data) is shown in Exhibit 4. The next exhibit shows an average profile, with the range of experiences in the blue shaded area. 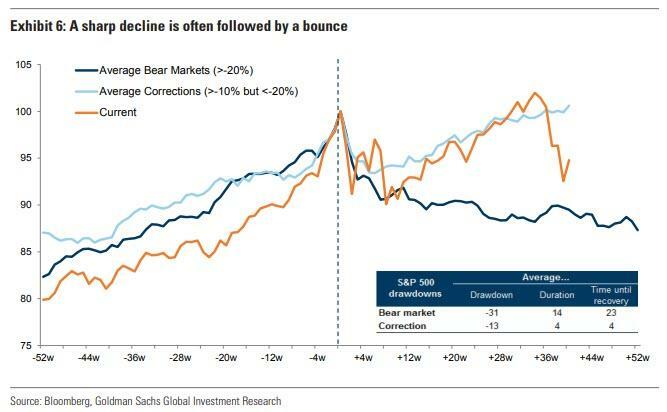 However, this is an oversimplification because the period over which the bounce occurs does vary, and sometimes the market has a correction and then a rally even before the actual peak (1987 and 2007 are examples) according to Goldman. On most other occasions the market correction comes after the peak; this tends to be followed by a bounce as the market recovers towards the peak before reversing again. But the common factor in all cases is that, with the exception of 1998, a correction and bounce can be clearly observed. Exhibit 5 shows this experience for each of the US bear markets since 1960. Late in the bull market investors are unclear about small corrections; they often perceive them as buying opportunities and are worried about missing such opportunities to increase returns. The bounce usually comes before there is any real ‘confirmation’ in the hard macro data that the initial correction is justified. When data start to confirm the justification for an initial market decline, prices tend to fall back further. Interestingly, EPS on average tends to start to fall 5 months after the peak of the market (although, as we discuss later, there is a wide variation around this). 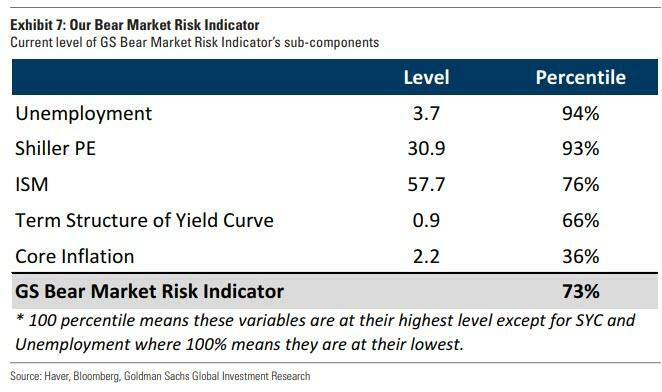 The risk, to Goldman, is that from these levels the market enjoys a short-term rally but this becomes a signal to sell rather than buy the market. The risk is further compounded, because as Morgan Stanley recently warned, after 11 years, BTFD no longer works. 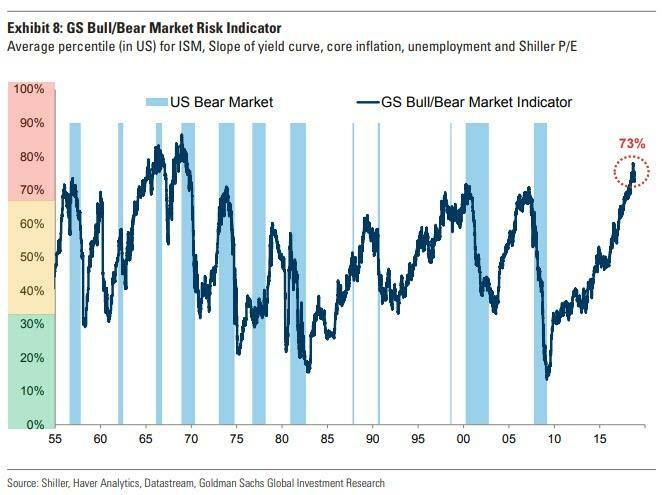 As we reported in September, Goldman recently constructed a bull/bear indicator based on the common pattern of a number of variables around the peak of previous bull markets. 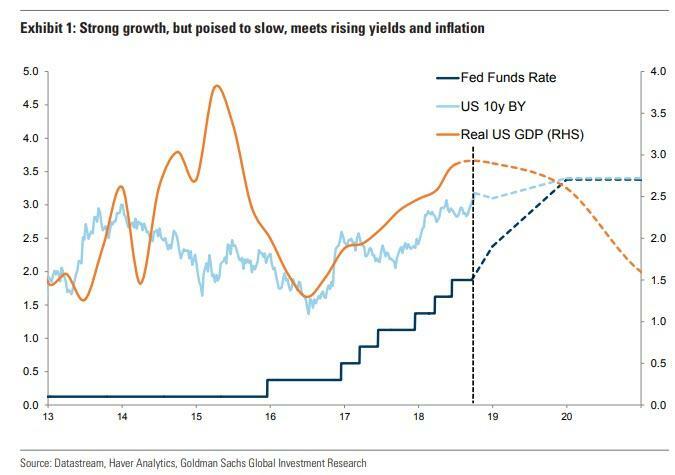 Goldman found that many bull market peaks were associated with a combination of conditions based on five factors: the labour market, growth momentum, valuation, term structure of the yield curve and inflation. In summary, the very low levels of unemployment (particularly in the US) scored as a high risk in the index. This is because low unemployment is normally associated with rising wages, margin pressure and tighter monetary policy. Also, every post-war US recession has been preceded by only modest rises in unemployment from very low levels (a third of 1%). Very strong growth momentum (measured by the ISM as an example) also flags as a risk. Of course, strong economic activity is generally a good thing for equity markets. However, very strong activity is typically followed by slower growth which, when combined with other factors (in particular much higher interest rates), can weaken equity prices. The third stretched factor on many metrics was valuation. High valuations in isolation do not provide much of a timing signal for investors but, again, when combined with other factors can indicate risks of a correction or possible bear market. So where are we now? As Oppenheimer puts it simple, "The signal is red." What does a high indicator mean? According to Goldman, the average return on US equities in any 12-month period since the 1950s has been 9%. Exhibit 9 shows what average forward returns have been conditional on the level of our Bear Market Risk Indicator. If the indicator is very low, at <20%, then on average equities enjoy returns of 20-25% over the next 12 months. But once the indicator rises to 40-60% then the average return becomes close to the longer-term average of c.9% over 12 months. What if the indicator is high? Above 60% and 12-month subsequent returns do tend to fall. We are currently at 73% and this is consistent historically with zero average returns over the next 12 months. Of course, there is a large range around this. 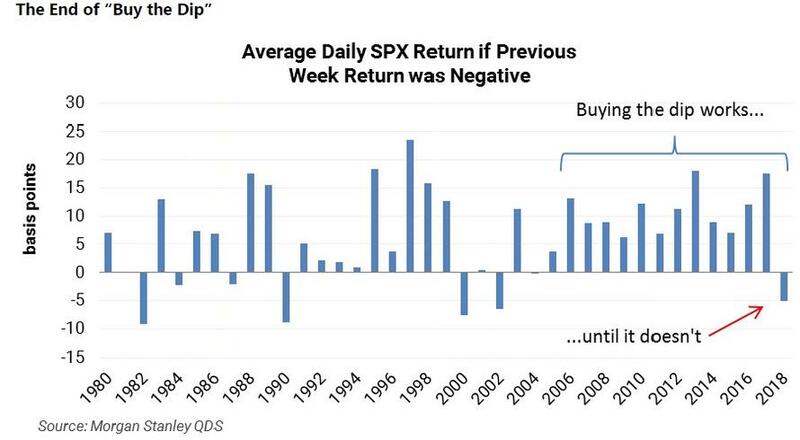 Moreover, this tends to give the impression of a flat market, whereas it could be anything but flat - a good deal of volatility with various drawdowns could still be consistent with zero returns over the year. Exhibit 10 shows the maximum drawdown over the following 2 years conditional on the starting point of our Bear Market Risk Indicator (the vertical orange lines show what the indicator would be using the US Shiller P/E as the valuation variable or the simple P/E ratio). At the current level of Goldman's Indicator, the maximum drawdown has been about 15% historically. This, by the way, is as close as Goldman will ever come to telling its banking clients to get out of stocks.